Obamacare passed its constitutional test as Chief Justice John Roberts punted. 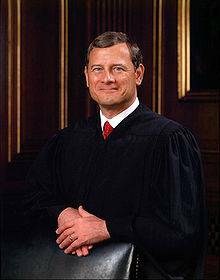 Roberts was left with a dilemma, does he overturn an important Congressional imperative by the narrowest of margins? This would have put the Court at war with the executive, an executive branch ready to do a search and destroy against the Court. In a war that would have resembled Roosevelt's war on the Court in the mid 1930’s, Roberts feared for the reputation of the Court, but on the other hand, there was no doubt that the mandate was unconstitutional and a complete misreading of the commerce clause. So Justice Roberts did something politically smart and constitutionally stupid. What Roberts did was give Obama his healthcare bill but not on Obama’s terms. Obama could not force a buyer to purchase insurance or any items as part of the commerce clause, but Congress can provide a service by taxing individuals. For Obama, he now has to admit that he has taxed the American people to provide Obamacare, and he has to defend one of the most massive tax increases upon the middle class. Between the expiration of the Bush tax cuts and Obamacare, Americans are about to be hit with the biggest tax increase in history and the middle class will not be exempt. The hidden tax created by Obamacare can no longer be hidden and the cost, as well as the effect, of Obamacare on the economy is now obvious. The second aspect of this is that conservative case against Obamacare and the decision written by Thomas will provide future conservative activists with the blueprint to overturn Obamacare and other congressional attempts to expand government. Centrist Justice Kennedy's dissenting vote is enough proof that there is a lively opposition to the leftist vision of the Constitution. Even Roberts admitted in his decision that there are limits to Federal power in respect to the Commerce Clause and the narrow decision dealing with imposition of additional mandates upon the states with regards to Medicaid expansion. This will provide future Conservative jurists with tools to expand upon in rolling back the power of the government. This is the first act of a debate that is needed, what are the limits to Federal power? Which brings us to the political side of this: Obama can no longer claim that he is not taxing the middle class. A pundit noted that while Obama denied that he would be taxing anyone with Obamacare, the Supreme Court stated that it was a lie. Obama is now forced to defend a bad economy that Obamacare will only add to and a tax increase upon the middle class. As one reporter on Fox Business News noted, there were 21 new taxes imposed by Obamacare with seven directed at the middle class, much of it hidden. She concluded that now there are eight tax increases directed at the middle class, and they are no longer hidden. The Republicans can no longer hope that the Courts will do their job for them by eliminating Obamacare, so the Republicans will have to do the heavy lifting. Roberts is not saying that this is a good law, but simply that Congress can use its taxing power to provide services and the Republicans can easily make the case that this is a bad law that is overpriced and will destroy the best health care in the world. Obama has his health care, but it could be the final straw that destroys his administration. And Roberts is telling Republicans that it is their responsibility to repeal Obamacare, not his.